These compact storage cabinets are the most efficient form of contemporary storage management which take less than 0,650 meters squared and can store up to 400/500 line items per unit. All cabinets are stand alone units, thereby alleviating assembly costs and enabling ease of re-arrangement at a later stage. 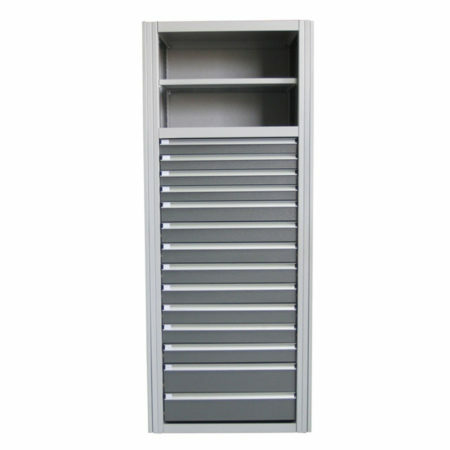 Drawers can be configured to suit customers requirements as long as cabinet heights are not exceeded. Each drawer is capable of housing 100kg of distributed weightload. Space Saving – quick, easy retrieval – good stock visibility – cleanliness and security – protection for precision tools and fragile items – flexibility in assembly – reduces production down time – increased productivity. Cabinets are sturdy and durable, with a scratch proof powder coating. Full width handles on drawers for easy drawer identification.